With on-board software and color touchscreen, Microsemi CRP simultaneously provides complete blood count (CBC) and C-reactive protein (CRP) from 18 ÂµL of blood within 4 min. CRP analysis allows patient sample screening for presence of inflammation caused by bacterial infections or other treatable inflammatory disease. Able to be used with capillary as well as venous blood samples, maintenance-free and intelligent instrument allows measurement immediately after blood sample collection. 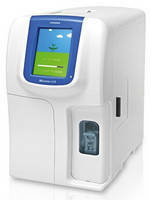 Unique combined blood count and CRP results from small blood volumes - in 4 minutes Northampton, UK - Horiba Medical, specialists in automated in vitro diagnostic systems for haematology and chemistry analysis, has launched the Microsemi CRP haematology analyser. Developed by HORIBA Medical in Japan, 'emi' means 'smile' in Japanese and stands for easy to use, maintenance free and intelligent. After a highly successful release in Japan, this unique instrument is now available in Europe. This compact, easy-to-use addition to the Micros range simultaneously provides a complete blood count (CBC) and C-reactive protein (CRP) from just 18 µl of blood - all in just 4 minutes. The Microsemi CRP provides information of great clinical value enabling quicker and more accurate medical decisions to ultimately reduce hospitalisation times and patient costs. Its powerful CRP analysis allows the screening of patient samples to detect the presence of inflammation caused by bacterial infections, or other treatable inflammatory disease. Measurement is possible immediately after blood sample collection, making this analyser the ideal choice for emergency testing situations. The Microsemi CRP can also be used to assess infection and inflammatory conditions that require progressive observation. Furthermore, its micro-sampling capabilities are ideal for paediatric blood analysis, requiring just 10µL for CBC and 18 µL for CBC+CRP, and can be used with capillary, as well as venous blood samples. Comprehensive and efficient on-board software, colour touch screen, alongside fast and easy access to results adds to the Microsemi CRP's success. Design features have created an environmentally-friendly model (using a non-cyanide reagent for haemoglobin measurement) that is incredibly compact, lightweight and quiet. The Microsemi CRP is easy to use and does not require specialised staff. All these traits make this analyser well-equipped to support changes occurring within the NHS focussed on easing the patient journey. According to Cleve Wright, UK General Manager, Horiba Medical, "With over 2000 instruments successfully being used in Japan to date, UK clinicians can now benefit from the Microsemi CRP's accuracy, convenience and ability to support early and rapid diagnosis of patients." For more information please visit www.horiba.com/uk/medical ABOUT HORIBA Medical - UK: www.horiba.com/uk/medical Resulting from nearly 30 years of understanding and meeting its customers' exacting individual needs, the HORIBA Medical team holds a wealth of expertise in haematology, and increasingly in clinical chemistry. Consequently, HORIBA Medical has become a well-respected and renowned specialist in the design and manufacture of automated in vitro diagnostic systems for haematology and chemistry analysis. HORIBA Medical now facilitates the entire haematology process, both in the laboratory and at the point of care, from process and analyser optimisation, analysing samples and managing data, including new computer-assisted microscopy options, through to remote monitoring and e-Learning. Furthermore, in addition to NHS and private healthcare settings, HORIBA Medical products are proving their worth in many other areas, including: veterinary diagnostics, sports science, food and beverage, pharma and nutraceuticals, and clinical research. From compact to high throughput systems, HORIBA Medical continues to successfully evolve, develop and deliver an array of analysers and reagents, as well as data management solutions to meet all needs, enabling LEAN analysis anywhere it is required. Indeed, through its commitment to providing the most comprehensive haematology portfolio available, 2012 will see the launch of a number of new products. These are all designed to provide the best possible solutions within a fast changing IVD world. HORIBA Medical's product and service combinations all deliver quality results, flexibility, security and process efficiency. These merits in turn ensure effective clinical decision making, enhanced patient care pathways and improved patient outcomes.